William Doherty, a lifelong resident of Rockland County, is retired from a career in building management in Manhattan. He was a history major at Roanoke College and a member of the history honor society. As a frustrated historian, he is making up for lost time, volunteering at the Historical Society. This is his fourth article for South of the Mountains. Your editor reviews Rockland Lake, Hook Mountain, and Nyack Beach by Robert C. Maher Jr.
A profile of our Visitor Services Manager. COVER PICTURE. Snowed lightly January 27 32-40 Ther. Cleared at 12 O'clock cloudy at 3 Went shopping this is the first time that I went out without my sling hand feels pretty good. [Minnie had broken her arm December 1.] I sent for a loud speaker to [Charles] Broadway Rouss for Fredy. sent check for the amount of 12.25. the 25 cts are for parcel post. About 4 O'clock a fierce snow storm which lasted only about 10 minutes then the sun came out. Warren wrote to his mother. Fred and I went to the Vault took Bonds there. 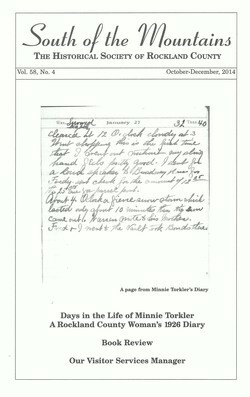 The page of January 27, 1926, from the diary of Minnie Torkler in the collections of the Historical Society of Rockland County. While all efforts are made to ensure accuracy in the articles, the Historical Society assumes no responsibility for opinions and conclusions expressed or implied by contributors. The editors welcome contributions of letters and articles. Please con­tact us at the Historical Society.